When Karen Pavlicin-Fragnito’s husband, Bob, was deployed to Somalia in 1992, she had trouble finding many resources for military spouses like her. Seeking to share advice and stories with others in their unit about the unique challenges of deployment, she began to do what comes naturally to her: write. After years of using that material in support groups with other families, she released it in 2003 in book form as Surviving Deployment: A Guide for Military Families. This passion for writing and desire to use her experiences to help others led her to found Elva Resa Publishing, the only United States publisher with an imprint specializing in military family life. Elva Resa’s core books focus on deployment, ranging from Surviving Deployment and the follow-up, Life After Deployment, to journals and activity books for adults and kids alike. The topics in Elva Resa’s award-winning books are as diverse as the military family experience itself. There’s advice on making the best of a mobile military spouse life, stories from Gold Star parents, and children’s books like Night Catch, which tells a heartwarming tale of a deployed father playing catch with his son using the North Star. There’s also The Wishing Tree, in which a daughter helps her father from afar by writing her wishes down on ribbons and tying them to a tree. 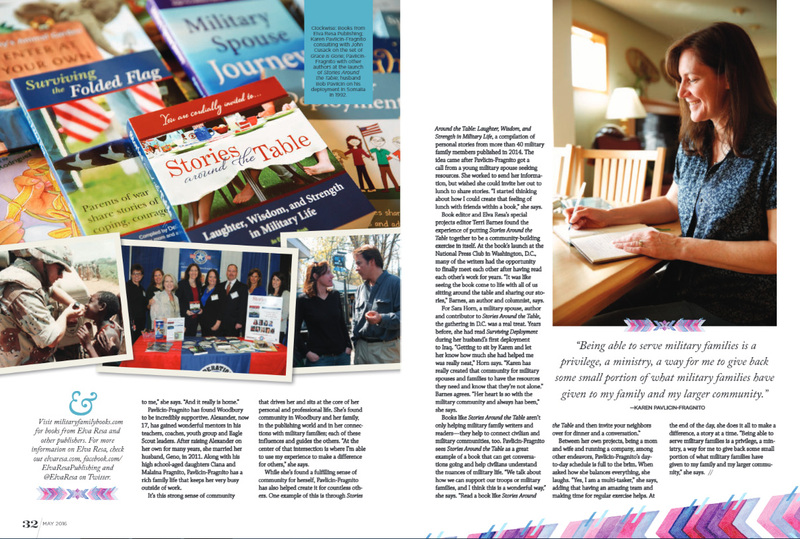 In addition to publishing books for all ages, Elva Resa collaborates with schools, nonprofits, military units and organizations around the world to create resources to support the military community. Pavlicin-Fragnito has worked with the creators of Sesame Street on military family resources, consulted with the director of the John Cusack film, Grace is Gone, and led workshops around the world. Pavlicin-Fragnito has found Woodbury to be incredibly supportive. Alexander, now 17, has gained wonderful mentors in his teachers,coaches, youth group and Eagle Scout leaders. After raising Alexander on her own for many years, she married her husband, Geno, in 2011. Along with his high school-aged daughters Ciana and Malaina Fragnito, Pavlicin-Fragnito has a rich family life that keeps her very busy outside of work. It’s this strong sense of community that drives her and sits at the core of her personal and professional life. 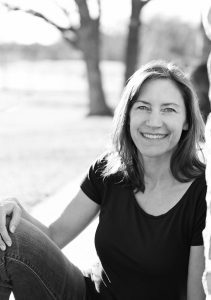 She’s found community in Woodbury and her family, in the publishing world and in her connections with military families; each of these influences and guides the others. “At the center of that intersection is where I’m able to use my experience to make a difference for others,” she says. While she’s found a fulfilling sense of community for herself, Pavlicin-Fragnito has also helped create it for countless others. One example of this is through Stories Around the Table: Laughter, Wisdom, and Strength in Military Life, a compilation of personal stories from more than 40 military family members published in 2014. The idea came after Pavlicin-Fragnito got a call from a young military spouse seeking resources. She worked to send her information, but wished she could invite her out to lunch to share stories. “I started thinking about how I could create that feeling of lunch with friends within a book,” she says. 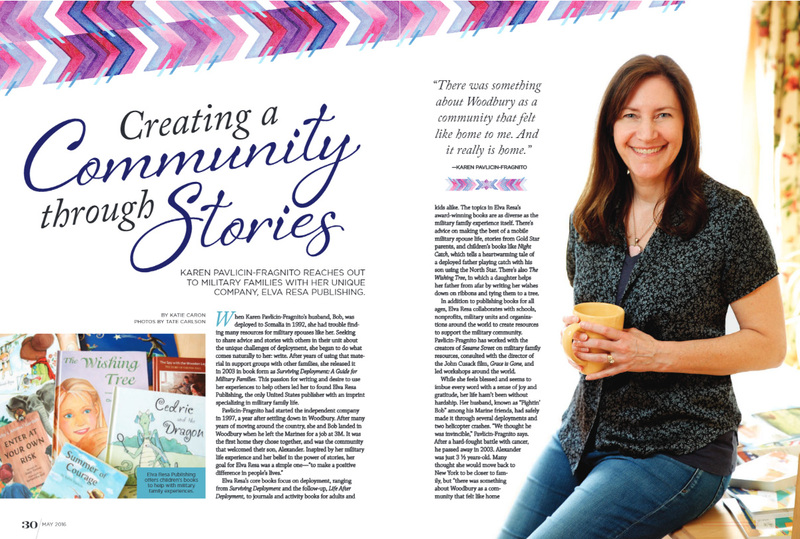 Book editor and Elva Resa’s special projects editor Terri Barnes found the experience of putting Stories Around the Table together to be a community-building exercise in itself. At the book’s launch at the National Press Club in Washington, D.C., many of the writers had the opportunity to finally meet each other after having read each other’s work for years. “It was like seeing the book come to life with all of us sitting around the table and sharing our stories,” Barnes, an author and columnist, says. For Sara Horn, a military spouse, author and contributor to Stories Around the Table, the gathering in D.C. was a real treat. Years before, she had read Surviving Deployment during her husband’s first deployment to Iraq. “Getting to sit by Karen and let her know how much she had helped me was really neat,” Horn says. “Karen has really created that community for military spouses and families to have the resources they need and know that they’re not alone.” Barnes agrees.“Her heart is so with the military community and always has been,” she says. Between her own projects, being a mom and wife and running a company, among other endeavors, Pavlicin-Fragnito’s day-to-day schedule is full to the brim. When asked how she balances everything, she laughs. “Yes, I am a multi-tasker,” she says, adding that having an amazing team and making time for regular exercise helps. At the end of the day, she does it all to make a difference, a story at a time. “Being able to serve military families is a privilege, a ministry, a way for me to give back some small portion of what military families have given to my family and my larger community,” she says. Visit militaryfamilybooks.com for books from Elva Resa and other publishers. For more information on Elva Resa, check out elvaresa.com, facebook.com/ElvaResaPublishing and @ElvaResa on Twitter.